…born Giovanni Francesco di Bernardone in Assisi Italy in the year 1182 and died there on October 3, 1226 at the age of 44. Francis was born to wealthy parents and enjoyed a life of privilege. However, when war broke out between Assisi and Perugia in 1202, Francis, looking for adventure, took his place with the cavalry. He was injured, taken captive for a ransom and imprisoned for a year. During his incarceration, Francis is said to have had visions from God which changed his life forever. Having been released from prison, Francis abandoned his life of wealth and social position to embrace a life of poverty and chastity devoted to the Christian message. Francis preached to the rich and poor; he suggested a life of poverty, leaving everything and owning nothing; neither one’s own life or goods and to follow Christ. ‘Peace and happiness’ was his wish for all. Francis’s embrace of Christ-like poverty was a radical notion at the time. The Christian church was tremendously rich, much like the people heading it, which concerned Francis and many others, who felt that the long-held apostolic ideals had eroded. Francis set out on a mission to restore Jesus Christ’s own, original values to the now-decadent church. With his incredible charisma, he drew thousands of followers from all walks of life, nobles, middle class and peasants. They listened to Francis’s sermons and joined in his way of life; his followers became known as Franciscan friars. St Francis is considered one of the greatest saints in the Christian tradition and an example of a life lived in imitation of Jesus Christ. 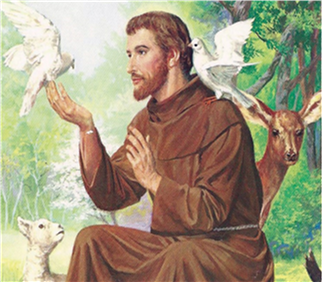 St. Francis of Assisi is the patron saint for ecologists – a title honouring his boundless love for animals and nature. Francis was a unique spiritual personality who, with the approval of the Pope, founded a new Monastic Order, commonly known as the Franciscans. He was canonized as a saint just two years after his death, on July 16, 1228, by his former protector, Pope Gregory IX. His feast day is celebrated on 4th October each year. It was not long before Clare of Assisi and her sister Agnes, from an aristocratic family, also wished to live according to his ideal. They became known as the “Poor Ladies” and later the “Clares”. 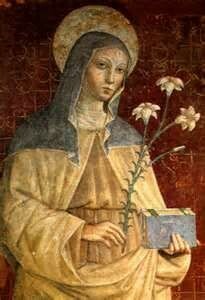 Chiara Offreduccio was born in Assisi on July 12th 1194. into a wealthy Italian family. Influenced by her mother’s religious devotion she was drawn, like Francis to a simple lifestyle. At an early age Clare was drawn towards helping the poor as she set aside food from her family table to give to the needy on the streets. At the age of 18, she heard Francis preach in the church of San Giorgio at Assisi and being inspired by his words, Clare asked Francis to help her in dedicating her life to God, and he vowed to do so. The following year (1211), Clare’s parents chose a wealthy young man for Clare to marry, but she pointedly refused, fleeing soon after for the Porziuncola Chapel, where Francis received her. She took vows dedicating her life to God, and that moment, occurring on March 20, 1212, marked the beginning of the Second Order of St. Francis. It wasn’t long before she was joined by her sister Agnes and many other women who, living an ascetic lifestyle, became known as the ‘Poor Ladies’. Clare cared for Francis toward the end of his life and was with him when he died in 1226. Afterward, despite ill health, Clare continued to promote the growth of her order until her death in 1253. The Third order followed as men and women, having a family and professional life, also wished to live in the spirit of St. Francis. They became the Third Order of Saint Francis. This Third Order expanded just as the first two orders had, first in Italy, and then in Germany where Elizabeth of Hungary lived. Originally founded as the Franciscans of Calais, the Order is known today as the Franciscan Missionaries of Our Lady. Like St. Francis, who is well-known for his love of nature, these Sisters are invited to prayers of praise and thanksgiving through the whole of creation. And, also like St. Francis, they honour Mary with a special love and devotion. Missionaries of Our Lady go out into the world to be witness to the Love of the Father. This missionary spirit has led these women of faith to 14 countries around the world to serve in the areas of healthcare, education, parish ministry and social services. The Sisters are attentive to all, especially those most in need, and they are working to make a significant difference in the world.